If eating blue cheese causes inflammation to develop anywhere in your body, make an appointment with your doctor because you may have an allergy to one or more of its ingredients. Blue cheese contains two highly allergenic substances: milk and mold. Most symptoms caused by an allergic reaction are the result of inflammation in soft tissue in different parts of the body. Your doctor may recommend allergy testing to determine the cause of the inflammation. Inflammation from a food allergy is the result of histamine produced in soft tissue. When you eat something that you’re allergic to, your immune system releases immunoglobulin E antibodies that attack the substance. If you’re allergic to milk or mold, you immune system mistakes the proteins in these ingredients as dangerous and attempts to fight off the proteins with the IgE antibodies. IgE antibodies trigger mast cells to produce histamine, which leads to inflammation. Histamine is commonly released in the sinus tissue, lung tissue, the skin and the tissue that lines the intestines. Milk is one of the most common food allergies in children and adults and is the main ingredient used to make blue cheese. If you have a known milk allergy, you need to avoid all dairy products, including cheese, yogurt and ice cream. Consuming even a small amount of milk can cause an allergic reaction, triggering diarrhea, nausea, vomiting, skin rashes, wheezing, shortness of breath, coughing and chest tightness. Most symptoms from a milk allergy will appear in a matter of minutes after ingesting blue cheese. The blue spots found in blue cheese are mold. 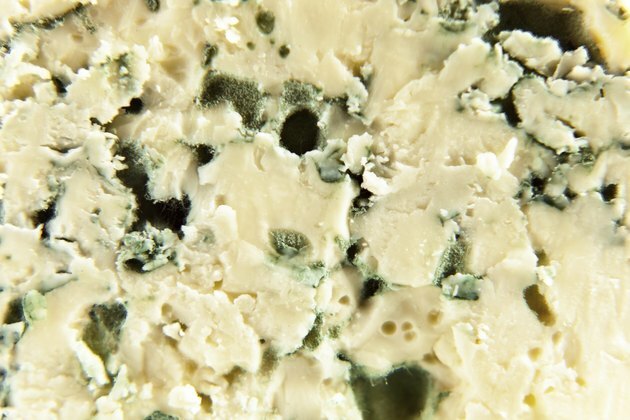 If you’ve been diagnosed with a mold allergy, eating blue cheese can trigger common mold allergic reaction symptoms. Mold allergies commonly arise from airborne spores during the spring, summer and fall months. Inhaled mold spores cause inflammation in the eyes, throat and sinuses. Ingested mold can cause inflammation in other parts of the body, such as the gastrointestinal system and the skin. If you have a mold allergy you need to abstain from dried fruit, aged cheeses and beer, according to the Cleveland Clinic. An extreme allergic reaction can cause excessive inflammation that can affect your respiratory and cardiovascular system, leading to a state of shock. Anaphylaxis occurs when your entire body reacts to the allergen and can cause the inability to breathe, dizziness, an increased heart rate and a sudden drop in blood pressure. This condition can cause death and requires immediate emergency medical attention.